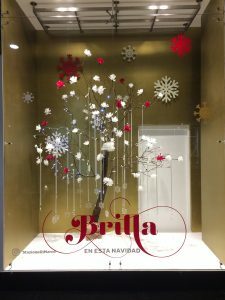 Elit Visual – STAZIONE DIMARCOS CHRISTMAS WINDOWS 2016 – Bucaramanga, Colombia, South America. This is an Elit Visual S.A.S. 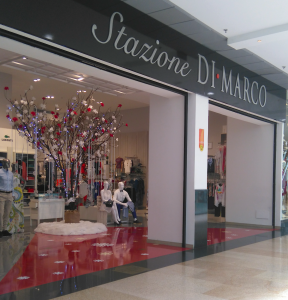 Christmas window 2016 and display production for multi-brand stores (Stazione-Di Marco, Dimarcos and Margarita Di Marco) located in Bucaramanga, Colombia, South America. 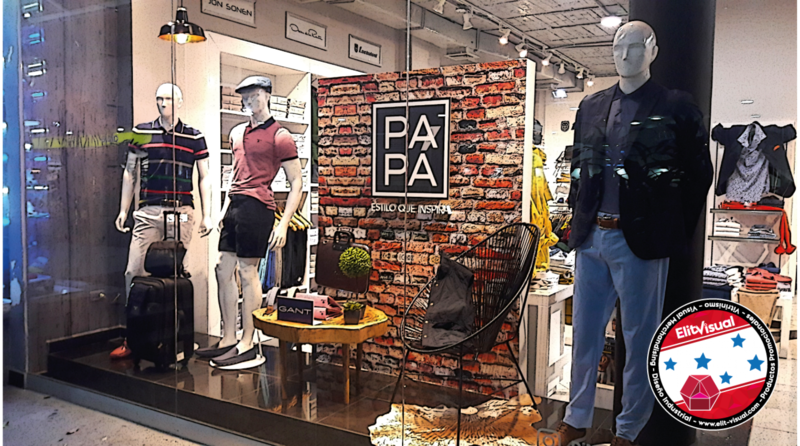 The whole idea was a conception from the owners of the stores based on the customer profile and their 40 years of experience in the fashion business, and it was a basic requirement for the production. 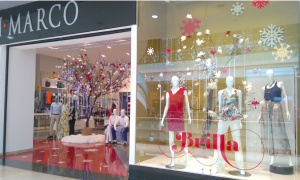 We, as an industrial design agency, got the idea and lead it to a happy ending in terms of visual merchandising. 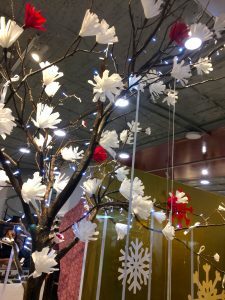 The spotlight in the window was a tree with lights and paper flowers with a half inch hanging white cloth tapes with small crystal clear snowflakes at the end. Each tree was made of many pieces of dead tree branches chopped by local Fire Department one night after a huge storm that destroyed the woods in a park in our city. So we took them and we put together like a puzzle in an easily removable way, just to make them effortless for working, delivery and storage. 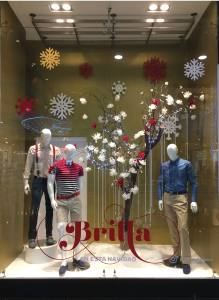 To accent the Christmas atmosphere a golden paint was used for walls and big laser-cut snowflakes over it. 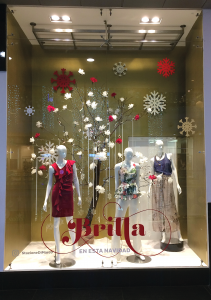 The copy “BRILLA En Esta Navidad” was given by their publicity agency, and was placed in the lower center part of the window/glass. 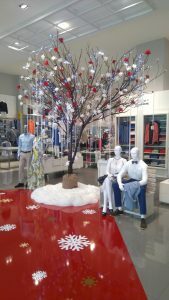 White floor pretending to be snow was reinforced with a foot of the tree made of cotton-polyester fabric known here as “wata”, with a little of an artificial snow made by us with small polycarbonate chips mixed with sodium polyacrylate and some water. Snow, because here we never have snow and it became a collective mind reference for Christmas in these latitudes (7º up to equator). Besides their customer are high-class people, so they are accustomed to travel to other countries and see a different kind of weather in Christmas especially in the northern hemisphere. 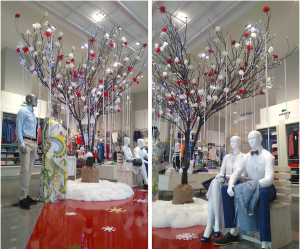 In addition to Windows, another focus display was placed in the entrance, with a very big tree in the same conditions as described above, but highlighted with a red-floor sticker with snowflakes on it. It took us about three weeks to get production done and two days to install all the elements and props.